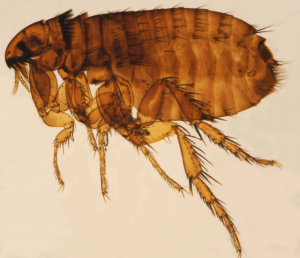 What's the Difference Between Mites & Fleas? Fleas and mites are two parasites that cause people untold misery. Few things are half agonizing as living in a house that is infested with either of these two pests. It is easy to confuse one for the other, mostly because they are pests whose effects on the human body are virtually the same. But these two parasites are very different, and especially in their anatomy. Here is a more detailed analysis of their similarities and differences. Physically, both of these tiny pests have quite a number of similarities. For one thing, they both have no wings. Additionally, they both undergo incomplete metamorphosis. Scientifically, they are also classified under the same phylum, which is the phylum arthropoda. Characteristics of members of this phylum include having a segmented body, which is the case for both these parasites. Fleas are tiny insects whose skin color is primarily brown. They are extremely minute which makes seeing them rather difficult. Fleas cause human beings misery mainly by sucking their blood. Although there are about 3000 species of fleas that have been identified, only a very small fraction of these fleas are harmful to human beings. In fact, the flea species that pose any serious health risk to human beings are not more than ten, with the most common ones being cat fleas, rat fleas, and human fleas. Rat fleas inspire particular terror in man as they are known to spread bubonic plague, which is disastrous, to say the least. Cat fleas, on the other hand, are known to spread tapeworms, which can cause you untold misery. Fleas are rather active, thanks to their long hind legs that are well adapted to jumping. This makes their eradication somewhat frustrating and an energy- draining task. Mites, on the other hand, are arachnids. The definitive characteristic of members of this class of arthropods includes the fact that they have eight legs and that their bodies are made up of two segments. Mites closely resemble spiders. Currently, about 50 000 species of mites have been identified. 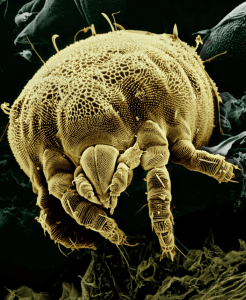 Most of these species of mites have no eyes, with the exception of a few which have extremely poor eyesight that only helps them detect the presence or absence of light. Although most mites are parasites that feed off human beings and other animals, there are some that feed on plants. Mites move chiefly by walking, but their legs serve other purposes, such as anchoring on the host’s body. From the above paragraphs, it is easy to identify the differences between these two pests. While mites are arthropods, fleas are scientifically classified as insects. Fleas survive only by sucking blood from their host animal while there are mites that eat vegetables. Additionally, the number of species that have been identified of both these parasites differs. Fleas are adapted to hop around using their strong and considerably long hind legs while mites move principally by walking using their short legs. However, despite all these glaring differences, it is an undeniable fact that the damage both these parasites cause human beings is intolerable. This is why most people would be excused for thinking that fleas and mites are the same, although they are clearly not the same.